Prepare a file with your own data. The file may contain CRM data on customers (emails and phone numbers) or mobile device IDs. The file must have at least 1000 entries and meets the file requirements. If you have security concerns, the data in your file can be hashed (md5). In the Segments tab, click Create segment and choose a suitable option from the Based on my data section, such as CRM data. Enter a name for the segment and select the file you've prepared. If the data in your file is hashed, check the box marked Hashed data. Please confirm you agree with the Terms of service and accept the Data Processing Agreement . Press Create segment. The segment you create will be assigned the “Processing” status. Processing can take up to two hours. 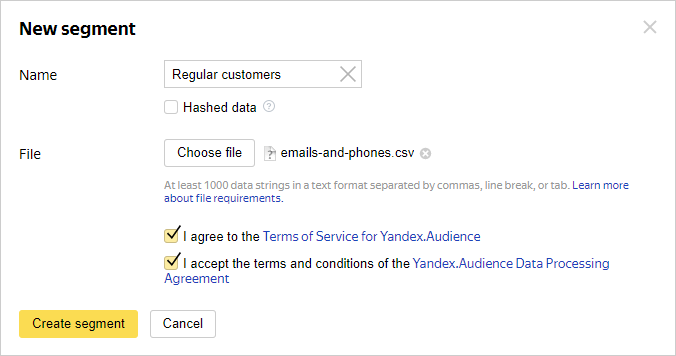 While processing, Yandex.Audience will find matches between the data in your file and all of Yandex's accumulated data. Yandex.Audience can use email addresses and mobile phone numbers to find data about users in Russia and the CIS, while mobile device IDs can provide information about users all over the world. For example, Yandex.Audience can identify your client as a user of one of Yandex's services or as a visitor to a Yandex Advertising Network site based on their email address.